Give the gift of a bucket list Broome experience with a gift voucher for a Broome Camel Ride. With the choice of a morning, pre sunset or sunset ride, the lucky recipient will be able to enjoy Broome in several different lights. Travelling aboard one of these friendly animals, the recipient will discover the beauty of Cable Beach as they leisurely travel the distance of it. Choose one of the tour times below and allow a lucky other in your life the chance to enjoy a must do Broome experience. 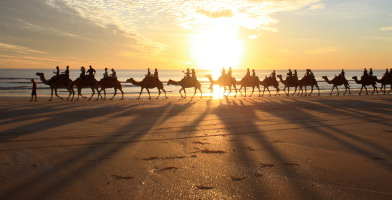 Spoil a lucky other with a Broome Morning Camel Ride along the scenic Cable Beach. Find out more about this gift voucher here. 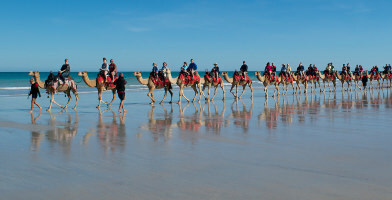 Round out an afternoon in the best way possible with a Camel Ride Tour along Cable Beach. Find out more here. 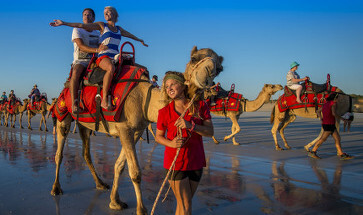 What better gift than a Sunset Camel Ride Tour along the beautiful white sands of Cable Beach. Find out more information here.